Investors are demanding increased risk management for their investments, representing an increasingly growing market for actively managed strategies. Surveys of investor attitudes typically fail in one major way: They start with an agenda that often has more to do with marketing than with trying to understand the investor. The Natixis 2014 and 2015 Global Surveys of Individual Investors stand out among the survey crowd as efforts to genuinely understand the individual investor. The results demonstrate the appeal that active investment management can have for investors who have lived through two major market crashes in the last 15 years. Among the most interesting results of the surveys is the belief among U.S. investors that the traditional approach to portfolio allocation is not the best way to invest. A majority of investors lack confidence that their current investment approach can deliver on the objectives they need. They would like to be more confident in the ability of their investment approach to protect from swings in value, preserve capital, achieve diversification, take advantage of bull market periods, protect from inflation, grow their portfolios, and provide income in retirement. 53% of American investors are willing to take only a minimal amount of risk, even if it means sacrificing returns. 84% of American investors would take safety over performance if forced to choose, an increase from 78% in 2014. 65% of Americans see market volatility as a factor that undermines their ability to reach their savings and retirement goals. Investors said they need to earn average gains of 9% above inflation annually to meet their financial requirements—a historically unrealistic rate of growth. Turn the first bullet point around and the result fits well with the broad objectives of a holistic approach to active investment management. Active management, based on technical analysis and dynamic risk management, is designed to reduce volatility, preserve capital, achieve diversification, take advantage of bull market periods, provide return levels that protect from inflation, grow portfolios, and ultimately provide income in retirement. Can actively managed strategies return 9%-plus inflation? Only time and market conditions can fully answer that question, but certainly the potential exists over the long run. The Natixis survey results show a majority of investors are dissatisfied with their current investment approach, with 60% in 2014 (increasing to 70% in 2015) saying traditional stock and bond approaches are no longer enough to pursue returns and manage risk. 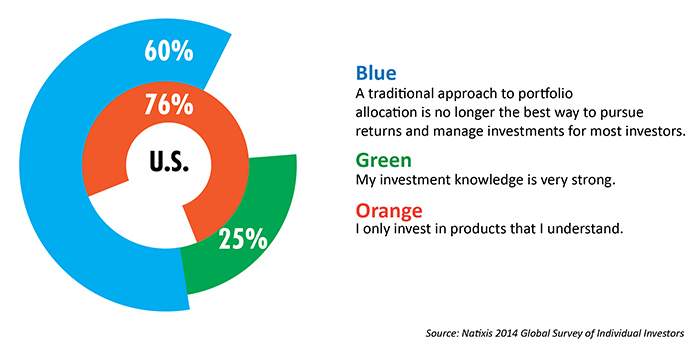 While the surveys do not specifically define that approach, traditional passive asset allocation is no doubt the most likely current choice for most investors. For active-management proponents, it comes as no surprise that passive allocation approaches fail to protect investors from severe market declines. Capitalizing on bull-market periods, while still protecting portfolios from down-market volatility, requires an investment strategy that adapts to current market conditions. Investors are not blindly accepting buy-and-hold and passive asset-allocation investing as the only way to investment success. They are looking for better answers. The potential market for active management that meets the investor’s need to balance risk and return is enormous. Managing risk matters. Marketing risk management used to be considered a nonstarter. People, it was maintained, invest to generate return—not to manage risk. This survey illustrates that investors are far more concerned with capital preservation than optimizing return. There is a strong interest in understanding and being able to measure investing risk. This changes the parameters of the investment decision. The emphasis is not on the historical performance of an investment class but on the volatility and risk-reward profile of that performance. Investors want to understand the investment approach. Active management needs to be presented in a manner that makes sense to the investor. “Black boxes” and overly complex approaches are going to be a harder sell versus a more digestible explanation of the broad objectives for actively managed portfolios. For advocates of active investment management, these results provide further evidence that individual investors recognize the risks of investing and are open to strategies that allow them to achieve reasonable returns along with capital preservation. And, for advisors considering expanding their offerings to include active, third-party money management, the surveys clearly demonstrate a great demand for the benefits that a sophisticated active investment approach can offer.